CHICAGO (CN) – A KFC franchisee who sells halal chicken to the Chicago-area Muslim community filed a federal lawsuit Monday challenging the fried chicken giant’s policy prohibiting franchisees from making religious claims about its food. Afzal Lokhandwala, owner of eight Kentucky Fried Chicken franchises in Illinois, sued KFC Corporation in Chicago federal court, arguing enforcement of the policy would force him to close four of his restaurants, which sell halal chicken that is permissible according to Islamic law. Lokhandwala, a practicing Muslim, says he immigrated to the United States from India in 1989. He started out as an assistant manager at a KFC on the South Side of Chicago, and soon became manager before starting his own franchises. He says he has been selling halal-certified poultry at his KFC stores since the first one opened in 2006. “Thousands of Muslims within the Chicago metropolitan area eat at plaintiffs’ restaurants because they know Afzal is Muslim and the restaurants sell halal chicken,” according to the complaint. However, in October 2016, KFC allegedly sent correspondence to Lokhandwala expressing concern that he was advertising and offering halal chicken in his restaurants, despite allowing him to sell it since 2003. 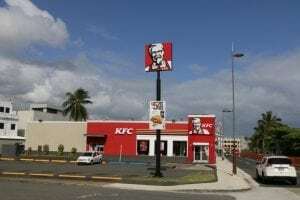 KFC also told Lokhandwala’s chicken supplier not to give the franchise owner a copy of its annual certificate from the Islamic Society of Washington Area confirming that it is a halal-certified slaughterer, according to the lawsuit. Lokhandwala alleges KFC never mentioned the policy in any of the parties’ franchise agreements, in violation of the Franchise Disclosure Act of 1987. He fears “the enforcement of the policy will severely damage plaintiffs’ revenues and threatens to put them out of business. Plaintiffs’ customer base and business revenue is heavily dependent on the sale of halal chicken to the Muslim community in Illinois,” according to the complaint. In February of this year, counsel for KFC suggested that Lokhandwala register as a dealer of halal food products with the Illinois Department of Agriculture in order to continue to sell halal chicken, he says. However, after becoming a certified dealer, Lokhandwala claims KFC still refused to allow him to post signage stating the name and address of the food distributor and slaughter facility, as mandated by halal food-disclosure requirements in Illinois law. According to the complaint, KFC has sent Lokhandwala cease-and-desist letters stating that he needs to stop making religious claims about the company’s products and his failure to do so would result in a breach of the franchise agreement and possible termination of his franchises. “Defendant has not adequately examined the effect that enforcement of their policy would have on plaintiffs, and are either deliberately enforcing this policy to destroy plaintiffs’ business or are doing so with reckless indifference to the continued viability of plaintiffs’ franchise restaurants,” the lawsuit states. Lokhandwala seeks a preliminary injunction against the religious-claims policy and wants a judge to declare that enforcement of the policy is in bad faith and not allowed by the franchise agreements. He is represented by Michael Goldberg in Chicago. Lokhandwala’s business entities for his eight franchises are also named as plaintiffs in the complaint: AFCO Services Inc., Bloomingdale Chicken Inc., Carol Stream Chicken Inc., Cicero Addison Chicken Inc., Fullerton Chicken Inc., Pratt Chicken Inc., Schaumburg Chicken Inc. and Streamwood Chicken Inc.
KFC Corporation is a Delaware corporation headquartered in Kentucky. It was founded by Col. Harland Sanders and has over 20,000 locations worldwide, according to the complaint.